I think it's great that businesses evolve - kind of finding a rhythm that works on practical and personal levels. 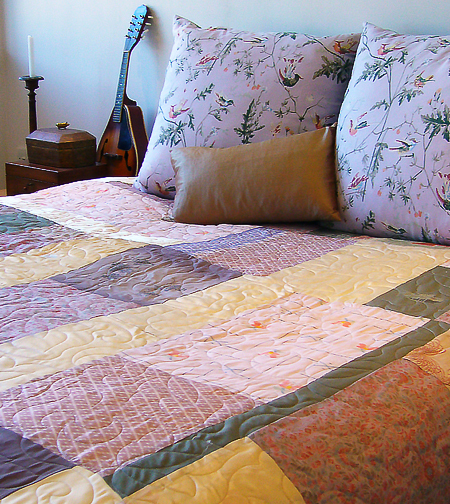 For me with our quilts, I've realised that I am happiest (and ridiculously lucky) to make commissioned quilts for people. I get to take their memories, their life and their story and turn it into something which will be with them and their family for the rest of their lives. It represents everything I feel about what home should be - practical, precious and personal. So that's a long winded way of saying that quilts are now only available by commission. It's not a scary process, but generally is quite emotional. Births, deaths, birthdays, marriages and divorces (a new life if you want a positive spin) have all been commissions. They are all life-changing parts of your life and they should all be celebrated or just remembered with dignity. I could write a novella on this but I wont. If it's something that you like the sound of, just get in touch. I can send or chat to you about everything you need to know.